Key Difference: Cereals are the grasses that belong to the ‘Graminaceae family’. Cereals are mainly cultivated for their edible dry seeds. Millet is a small grained annual cereal and forage grass that is widely grown in dry regions. Millet and other cereals are grown for food and fodder. Cereals are the plants from ‘Graminaceae family’. These plants are generally cultivated for their edible grains. The most common and important cereals are maize, rice and wheat. 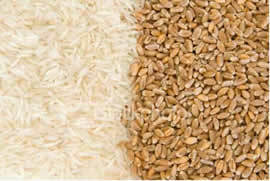 Cereals also include barley, oats, rye, sorghum, etc. The cereals as whole grains are vital source of vitamin, minerals, fats, oils, protein and carbohydrates. The cereals are composed of endosperm, germ and bran. 1. Endosperm: a food storage tissue present in the seed. It is the starchy part of the grain that remains after the refining of cereals; generally obtained by removal of germ and bran. 2. Germ: it is the reproductive part of the cereal that germinates and later grows into a plant. 3.Bran: the outer covering of a cereal grain is known as bran. It is used as a source of dietary fiber. Cereal plants are found all over the world, except in areas with acute dryness like desserts or the ice-covered poles. The suitability of a climate can differ from plant to plant. For example, oats and barley grow in low temperatures, rice needs water logging, etc. The cereals usually have long and thin leaves. Among the cereals, wheat and barley were the first wild plants that got noticed by the man of Stone Age. At that time, the men collected these cereals and used them in preparing meals. It is very important to ensure that the grain is stored properly after the harvest. This is important to prevent pest infestation and grain germination. The milling process of cereals generally involves grinding, sifting, separation and regrinding. Whole grains are preferred in prevention from some chronic diseases. A variety of cereal products are obtained from cereal grains. Millets are small-seeded grasses and grow well in dry zones. 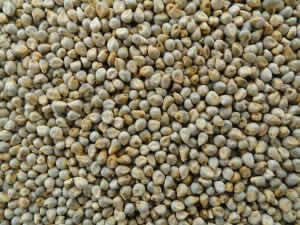 Millets require warm temperature for germination and also for the development. Millets cannot grow in water- logged soils. Millets are also preferred by the farmers as they have a short growing season. It nearly takes sixty five days to mature. Millets are known for their nutrition content. They are easy to digest and also contain a high percentage of minerals like magnesium, phosphorous and potassium. They are best grown by using farmyard manure, under purely eco-friendly conditions. Millets are generally mild sweet and nutty. The seed of Millet is known to be an ancient seed that was originally cultivated in the dry climates of Africa and Northern China since the Neolithic Era. Ground form of millet is used in making flatbreads. Millet has been used as bird and livestock feed in Western Europe. The varieties of millet include pearl, foxtail, proso and finger. It is used in main dishes as well as in desserts. Due to its nutty favour it is preferred as an additive to the basic recipe. Thus, we can define millets as a type of cereals. Like other cereals, millets are also very rich in nutrient. Millets and other cereals are very important as they help to meet the nutrient needs of humans. Millets are of great importance as they have a short growing season and yield higher productivity even under heat and drought conditions.